The Haircut Umbrella is a device that you can attach to your body so that when you get a haircut, your hair will fall into the upside-down umbrella instead of the floor. 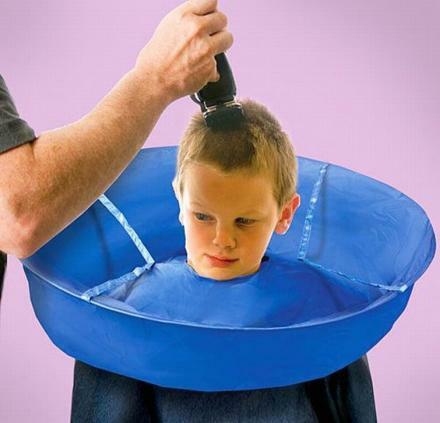 Vaguely resembling a backyard kitty pool, the haircut umbrella is perfect for the amateur hair stylist, a lazy father giving his reluctant child a haircut, a food-catcher for someone carelessly shoveling potato chips into their face, or for a serial killer that’s looking to keep his floor clean of blood. The Haircut Umbrella cape is made from nylon, folds easily to store away, works great for children or adults as it is easily adjustable to fit any neck size, and measures 25 inches in diameter.